This article looks at the problems of Implementing an Agile Follow-The-Sun Model. The world these days seems as if everyone is on-line, constantly connected. Therefore there is no downtime any more for Products that wish to survive in a 24/5.5 working week. These products must be built, enhanced and maintained. As we know from experience Waterfall cannot solve this problem, only Agile can. This has been documented in many places  and . How can a follow the sun model work for Agile teams spread across the globe? What happens when we come to demo/psi to the Product owner across global teams review meetings? How do we perform global retros? How do we refine the product backlog? What is required are multiple teams that work upon the same product. With this advocated as the solution it is not surprising that scaling frameworks have come to the fore. The point they miss is that modern Agile teams are now global. The flow does not stop when one teams Iteration/Sprint Ends. The Product flow must be handed to the next team to continue the Value Stream/Chain . 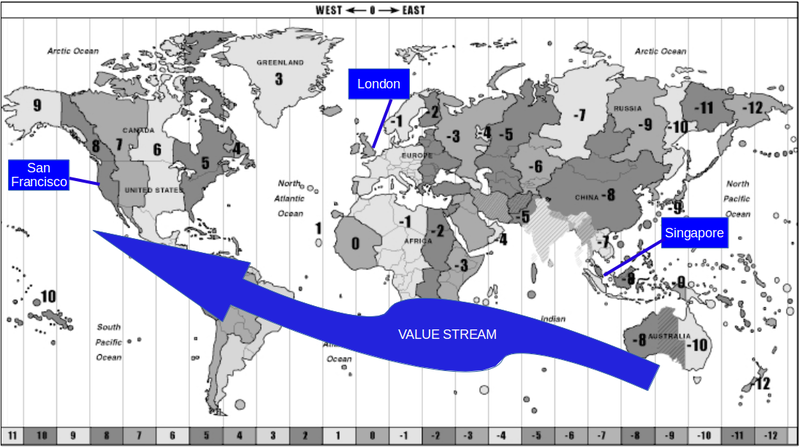 As we can see from the above diagram a team in Singapore will have had their daily team meeting/scrum and at the end of the day will have another scrum meeting to hand over to the London team. The objective of this handover should be hopefully to hand over as little as possible. Thus giving a clear run to the next team. A relay race if you will, where the baton is handed over cleanly. London then hands over to San Fran, San Fran to Singapore and so on at the end of the day. For the events that an Agile team has to perform nothing changes. They still perform the same activities at the same time, however they will need multiple Product Owners, multiple Team Leads/Scrum Masters. These many will have to co-ordinate (tel/video-conferences) together to make it work. To make this scale there will either have to be a Product Manager as in SAFe  or one of the PO’s will wear a dual hat as a the Lead PO. A single accountable person is always needed to make the final decision. They should of course be totally empowered and available to make that decision. No silent and disengaged stake holders. The same goes for the Team leads and if possible get the teams together. Sometimes fly them out during quite times, video conferences for the teams. Bring them together during industry events. There are many activities that can be done. Flowing Global Agile Delivery is possible but not easy as the teams must evolve to act as One Team.